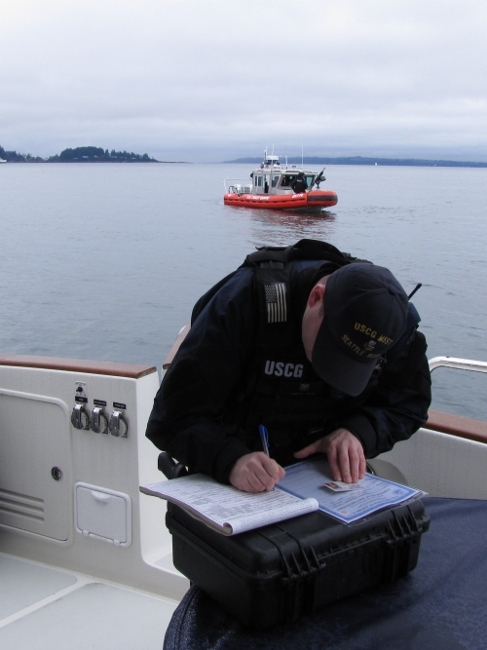 Two weeks ago, while anchored off Blake Island, a Defender Class Coast Guard boat approached. Rare before 9/11, we now frequently see these boats around Elliott Bay, accompanying ferries, patrolling the shoreline, or passing through Bell Harbor Marina where we often keep our boat. This one approached unusually close, and the crew indicated that they wanted to board us. As they approached Dirona from the swimstep, a crewman at the bow counted down the feet between the two boats so the helmsman could stop their vessel just shy of contact. 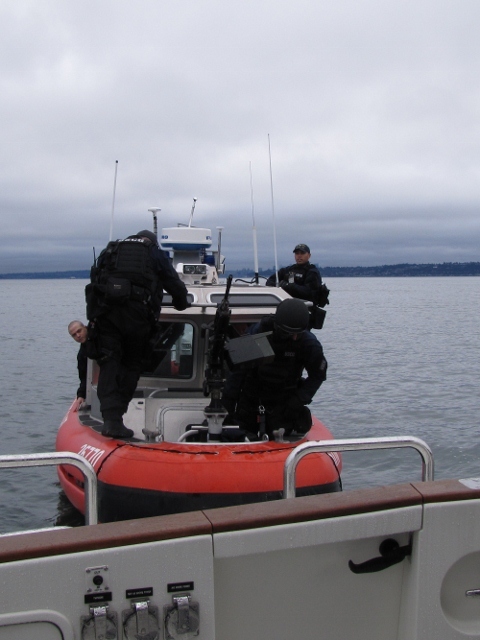 Then three of the five heavily-armed crew came aboard to inspect the boat, while the other two stayed aboard a short distance away. The boarding crew introduced themselves and explained the process. The first question was if we had any firearms on board. Then they asked to see our identification and proof of ownership/registration. The next item was checking for sufficient lifejackets. We carry 2 Mustang MD3183 inflatables, 2 Mustang 2175 flotation suits, a Mustang Floation Bomber Jacket, 2 offshore lifejackets, 2 Stearns 29-79 Type III vests, 2 Stearns waist-pouch inflatables, and 6 near-shore Type IIs. After the lifejackets, they asked about pyros. I wondered to myself why they would care if we had pyrometers on board, but it was pyrotechnics (flares) they were after. 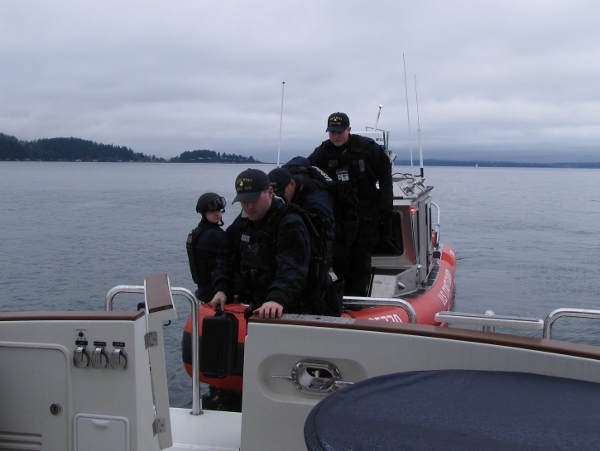 The final concern was that black water didn’t discharge overboard, and then we were done. The boarding crew was polite and efficient–the whole process took less than 15 minutes. Since we’re out on the water so much over the past decade and the Coast Guard has never boarded any of our boats, we felt due. Most boardings we’re familiar with have, however, been of vessels underway. The weather that day might have been part of the reason for the at-anchor boarding–it had been foggy earlier that morning. The boarding crew told us that they were out boarding boats and were worried there wouldn’t be any out there in the fog. Yes, that’s the same two life rafts we were looking at as well — they both are good. Arguably the Givens is better value. We though the SAR 6 a slightly better design but they are clearly both competitive. Thanks for the info I was looking at the same Switlick and the Givens Yachting Deluxe 6 man http://www.givensliferafts.com/liferafts/yachtingrafts/yachtingrafts/deluxe.html BTW Cruising the Secret Coast was the 1st I bought for the PNW crusing. We like the all the Mustang gear but I especially like the 2175 (//mvdirona.com/TravelArticles/PY_DEC07_35-39_WINTER.pdf). It wonderful to be both warm and safe on a cold winter day. We carry a Switlick SAR 6 Mk-II (http://www.switlik.com/marine-catalog-solas-SAR-6-MKII.html). I’m new to boating in the PNW so I am in the process of gathering info for the survival gear, I like your pick on the Mustang inflatable PDF. What liferaft do you carry? 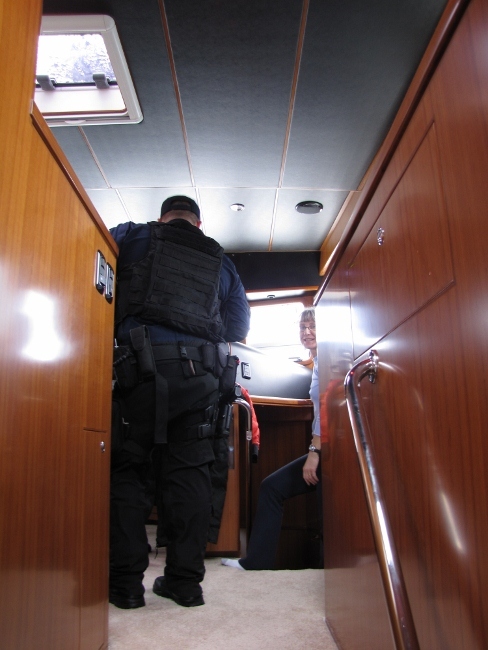 Back in the ’80’s, when South Florida was the drug transit capital of the world, there was a legal ruling that allowed searches of boats without a warrant. I’m a little hazy on the facts of the case (read: couldn’t be bothered to spend 1.4 seconds to do a google search) but it ended up going up the appeals ladder a ways. The upshot was that because a boat is much more mobile than a house – duh! – or a car, warrants would take too long and the boat might be gone before the cops could serve the warrant. 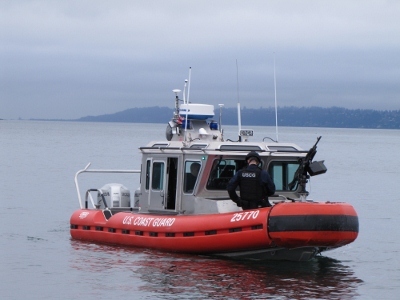 The Coast Guard has taken that to mean they can legally search a boat without probable cause and without a warrant. Personally, I don’t see how that fits with the Fourth Amendment, but I’m not a lawyer or a Coast Guard Commander. 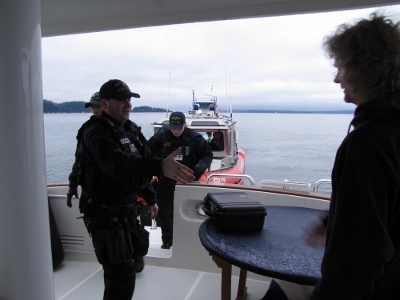 In any case, the Coasties have the right to stop you at any time and perform a search. The same is true in Canada. I’ve been stopped by the Canadian Coast Guard and in another incident, been boarded by the RCMP for identification checks. Living, as I do, on San Juan Island I ride the ferries on occasion. 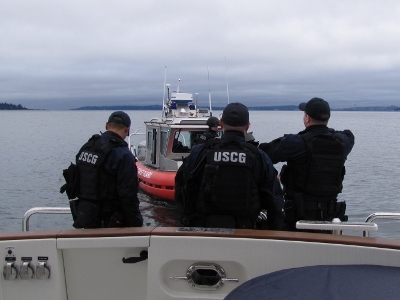 Washington State Patrol officers have told me that they don’t need a warrant to search the car because I’m riding a ferry, hence am subject to Coast Guard rules. I don’t participate in illegal activities as a matter of course, but there’s something that doesn’t pass the sniff test with warrantless searches. My guess is that they just wanted to see your awesome boat and couldn’t wait for the next Trawler Fest. Bruce, you are right that the boarding team were probably a bit over-armed for safety checks. I suspect this is driven by the Coast Guard being a multi-mission force where some missions require more weapons that others and they arm based upon alert level rather than what they are actually planning to do that particular day. Frank brings up a strange asymmetry in our legal system. To search a private house or car, probable cause must be shown. To search a boat, nothing at all is required. I’m not crazy about that aspect of our legal system especially since our boat is our house but the law is as the law is. This is not the only issue where I think change would be beneficial but, hey, I’m not frequently consulted by Washington on policy questions:-). One has to wonder why; if they are "just checking to ensure you had the proper safety equipment", they are so heavily armed. I suggest their primary mission is more along the lines of National Security or Drug Enforcement. The Coast Guard crew was great. They were just checking to ensure we had the proper safety equipment. 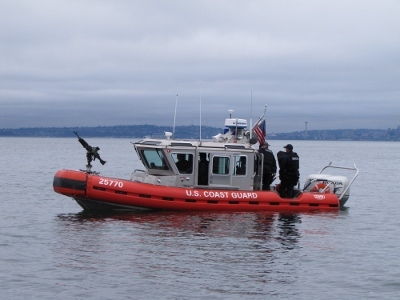 It’s nice to see that the Coast Guard crew didn’t freak out at being photographed, that it was mutually respectful.